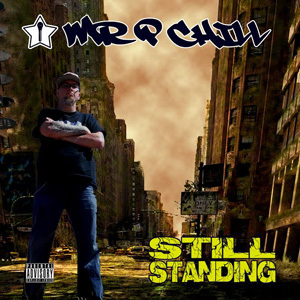 Mr. P Chill: "Still Standing"
Sacramento Hip-Hop artist Mr. P Chill drops his latest album, Still Standing, on August 28. His 11th record in the past 13 years, Still Standing is a tribute not only to his fans but to his own longevity in the music business. And with a bevy of guest appearances and a nearly continuous touring schedule, Mr. P Chill shows he's not merely Still Standing, but also planning to be around for a long time to come. would make a good tattoo, right? The title track kicks off the record in inspirational form, an autobiographical tale of dedication and persistence. Immediately, Still Standing turn its focus from Mr. P Chill's own life story to those who helped create it, dedicated to "the most important people in his life": P Chill's impressively loyal fans. "You Got Me" is all about those people who have supported his career throughout its 23 years, coming to shows across the country and buying his music and merch. Specific shout outs go to the fan (or were there more?) who got a tattoo of his mic/star logo. That's part of the aforementioned "impressively loyal" vibe. "When Words Won't Do (w/2Mex)" is the first single from Still Standing. It, along with "Time Machine" take on a more reflective, introspective tone, one that epitomizes P Chill's songwriting. It doesn't get more honest and real than Mr. P Chill. No ego, no pretentiousness. He loves rapping, has a passion for Hip-Hop, and an appreciation for artists who put their all into their music. Joining Mr. P Chill on Still Standing are a few of his closer Hip-Hop family, including Lumis, J.Smo, and Mr. Hooper (formerly Crazy Ballhead). But standing out in the credits are 2Mex (of The Visionaries and Of Mexican Descent fame), Percee P (Stones Throw), and the legendary Spyder D.
Speaking on Spyder D's appearance, P Chill shared that he was "pretty stoked. [Spyder D] is credited with being the first rapper to release [an independent rap record] in 1980. Dude did the whole thing in the 80's, rocked with RUN-DMC, and was managed by Russell Simmons. Pretty cool working with a guy you listened to as a kid. So humbling..."
Beginning in late August, Mr. P Chill takes this album on the road, literally across the entire country. Audiences from Sacramento to New York City can see P Chill with tourmates Cleen and DJ Uppercutz. For more information on Mr. P Chill, Still Standing, or his latest tour dates, visit mrpchillmusic.com.